This early-bloomer with real flower power offers different colour tones as well as some spotted types. Very free flowering and eye-catching in borders or containers, this beautifully balanced blend of pink, magenta, gold, purple, mahogany and cream will complement any garden. 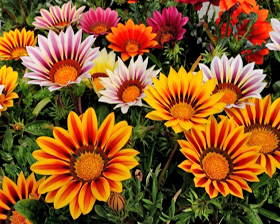 Sow Gazania seeds February to April and cover the seed with a very fine sprinkling of vermiculite. Keep at a temperature of between 20-25C. Germination will usually take 14-30 days.